Moore, Robert, and Gillette, Doug. 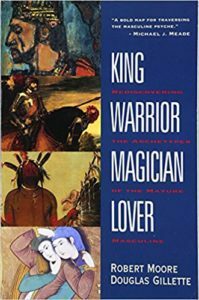 King, Warrior, Magician, Lover: Rediscovering the Archetypes of the Mature Masculine. New York, NY: HarperCollins Publishers, 1990. The four archetypes on which the Shadow Work® four-quarter model is based, as they were originally delineated by Jungian psychoanalyst Robert Moore and co-author Doug Gillette.